Can you believe we are in September already? I'm sad to see summer go, but I'm excited for fall festivities. What do you have planned for Labor Day Weekend? We have a few family cook outs I'm looking forward to. 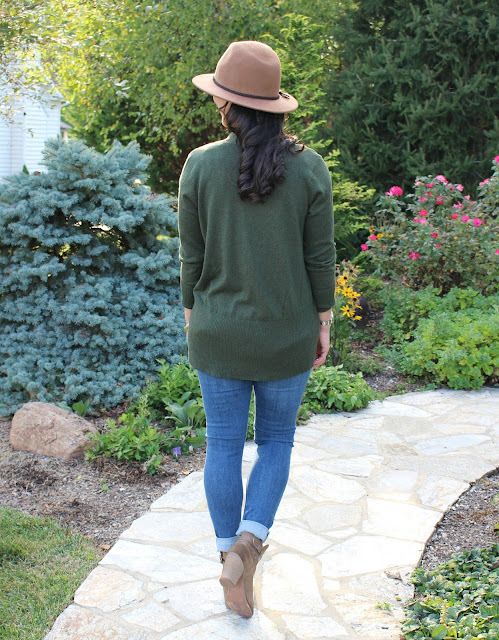 I absolutely love today's casual fall outfit. 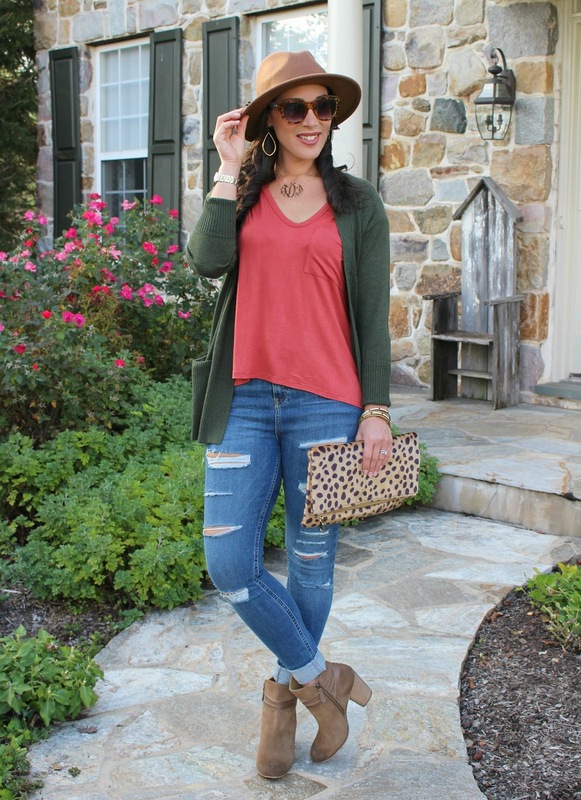 This post is full of closet staples for the fall season. 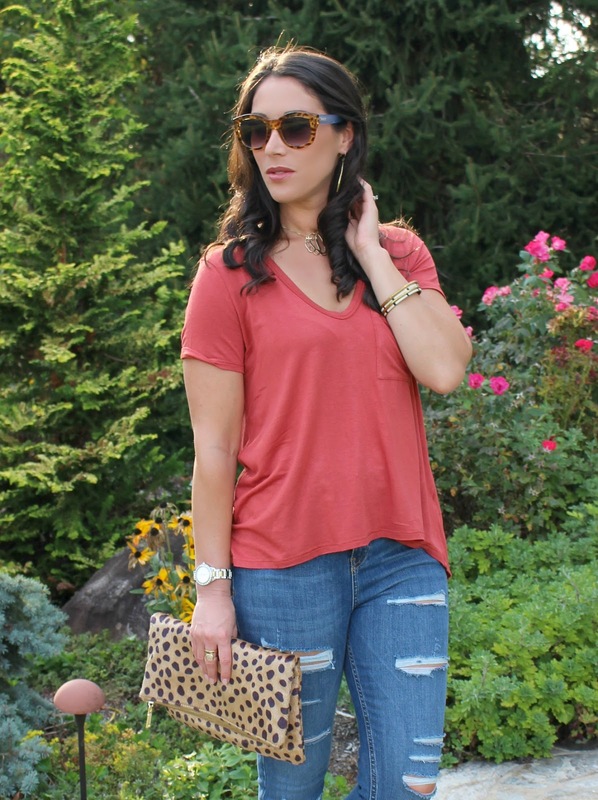 The Lush Deep-V Neck Tee is my favorite! I bought it during the Nordstrom Anniversary Sale because of the raving reviews. I didn't understand what all the fuss over a tee was, but this one really lives up to the hype! It's super soft, shorter in the front/longer in the back (good for the front tuck), and perfect for layering. After the sale, it went back to full price but Nordstrom recently marked this color (tandoori spice) and a few others back down to $14.90! Be sure to grab one before they're gone! For jeans, I wore my Topshop 'Jamie' Ripped High Rise Skinny Jeans. 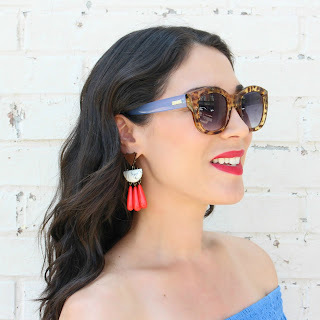 I've blogged in these a lot lately, but haven't gotten to wear them due to the hot temps! I'm looking forward to wearing these out this fall. 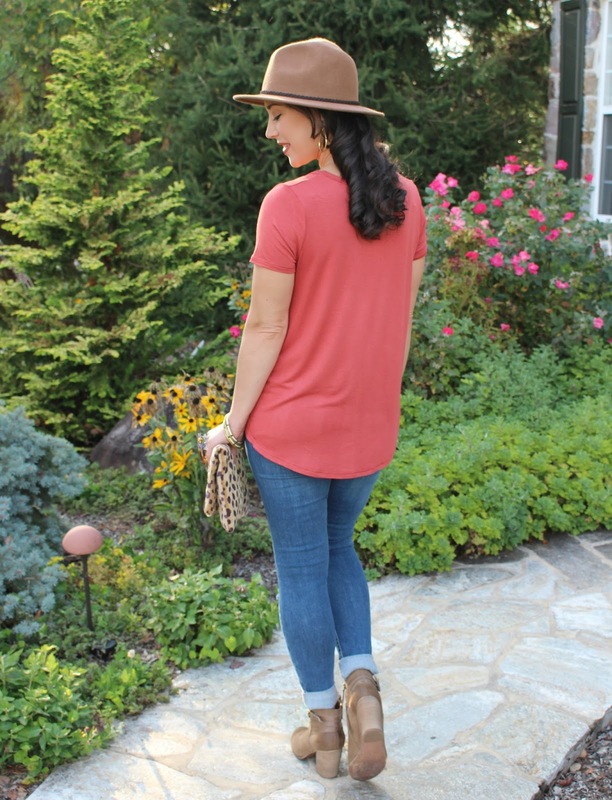 They are the perfect skinny jeans for short or tall boots. For reference, I'm wearing a 30x32 (they run small). I'm so excited to let you guys know that the BP. 'Tandem' Booties I've styled in several recent posts are back on sale! These were one of my NSale purchases and for some reason, they are 40% off again (woohoo!). I can't recommend these booties enough...if you're looking for a comfy pair to wear all fall and winter, these are it. The khaki color matches everything! 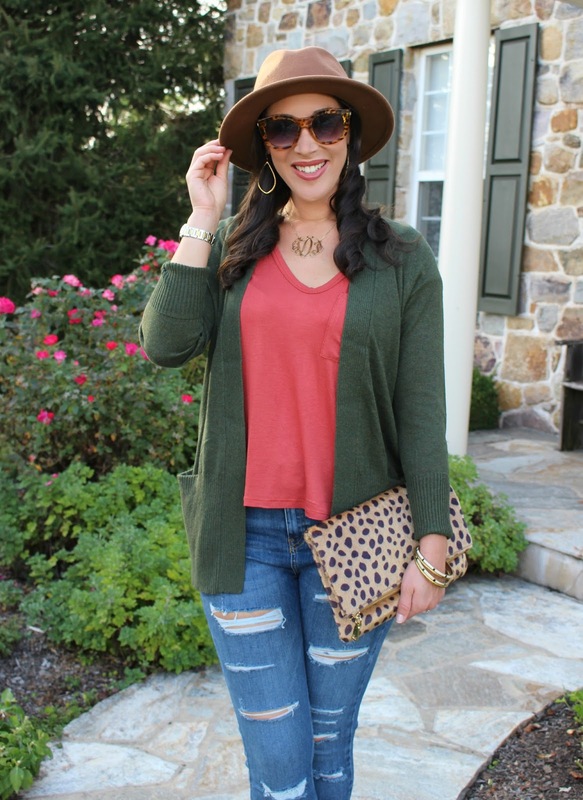 When it gets cooler, layer this tee with an open front sweater cardigan (another fall closet staple + I'm loving olive right now). I love shades of burnt red and orange with olive green. I recently found this Sonoma cardigan at Kohl's. It's lightweight, comfy, and has pockets in the front! This cardigan is on sale for $24.99 which is a great price! For some reason, some of the colors and images aren't showing up online, but here's the link to this exact cardigan...and it's in stores right now. For a bag, I carried my Le Boutique Shop animal print foldover clutch. 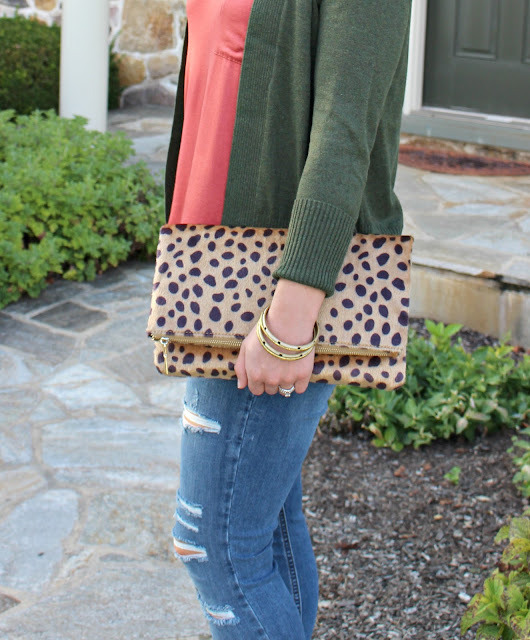 I think leopard print is so chic with this outfit color palette. If you follow my blog, you know this clutch has been on repeat lately! It's so versatile. 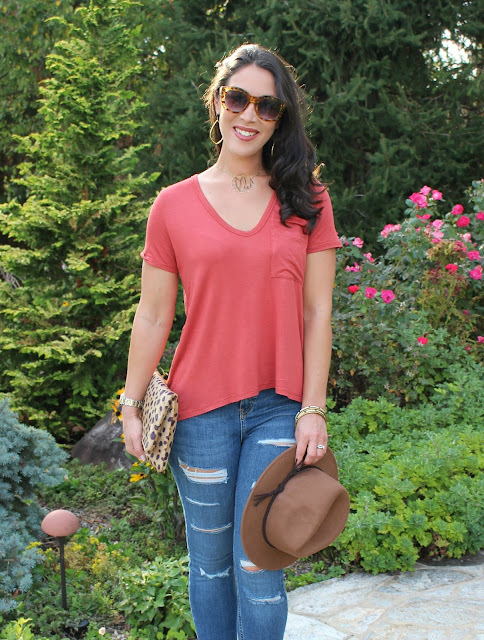 For another fun fall accessory, I wore my braided felt fedora from Kohl's. This hat is on sale for $30 and is a trendy neutral colored hat for fall/winter. Loving this look!! Such a cute clutch!! Gorgeous and what a steal!! I love this color combination on you! I am totally copying this look! I've been drawn to simpler tops like this lately. Love that they're so comfortable and it really is just a matter of styling to elevate them!